BRANDON, MB – Canada’s preeminent television journalist Lloyd Robertson will be given an honourary Doctor of Laws (honoris causa), during Convocation at Brandon University on May 31st, 2013. Robertson is one of the most trusted faces in TV news, spending 35 years as Chief Anchor and Senior Editor of the country’s most-watched national newscast, CTV National News. 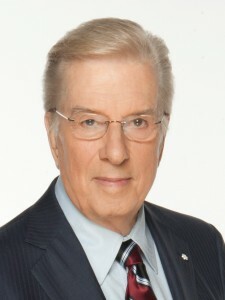 A broadcaster since 1952, Robertson is a three-time Gemini award winner, and member of both the Canadian Association of Broadcasters Hall of Fame and the Order of Canada. In addition to television work, Robertson was honourary chairperson of the Terry Fox Run. In 2006, he received an honourary degree from Royal Roads University in Victoria, BC. Robertson will receive his BU degree next month, along with 600 BU graduating students.